On air on Arte this month. “Des Monuments et des Hommes” (Monuments and Men) is a fifteen episode docu-series of 26 minutes each capturing the history of sacred monuments, the people who built them and those who visit them today. Sub-lime! A very, very beautiful collection. 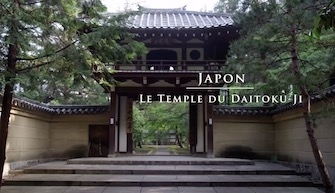 This particular excerpt focuses on the Daitoku-Ji temple in Japan. I am deeply grateful towards the TV channel and its production team for having chosen me for this project.